Construction of the USS Akron, the first rigid, lighter than air ship (dirigible) built in Ohio. The airship's first flight was on September 23, 1931. It crashed into the Atlantic Ocean during a storm off the coast of New Jersey on April 4, 1933. Zeppelins are a type of airship, named for and invented by Ferdinand von Zeppelin. They are also known as blimps, airships, and dirigibles. These vessels once used heated air to become airborne. Over time, hydrogen and helium replaced the heated air. Zeppelins are different than hot-air balloons because balloons float with the wind, while zeppelins have engines that can steer the airship. Zeppelins have transported people: militaries have used them in wartime to observe and bomb enemy positions; and companies have also utilized them to advertise products. The center of zeppelin production in the United States was Akron, Ohio. In 1916, the Goodyear Tire and Rubber Company purchased land near Akron to build a plant that could produce zeppelin aircraft. In 1917, the main Goodyear Company created a subsidiary known as the Goodyear Zeppelin Company to manufacture the zeppelins. That same year, the firm received a contract from the federal government to manufacture nine zeppelins for the United States military during World War I. 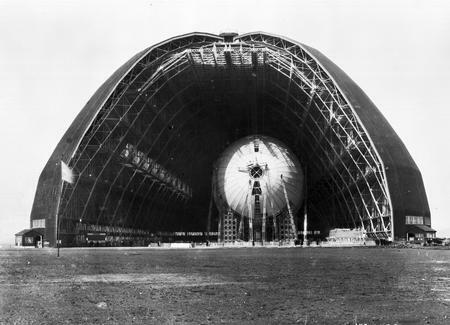 Unfortunately for the company, its manufacturing facilities were not complete in 1917, so Goodyear completed the first airships inside of a large amusement park building in Chicago, Illinois. The military used these airships to bomb and to spy upon enemy positions. At the conclusion of World War I, the Goodyear Tire and Rubber Company continued to manufacture zeppelins. The firm used most of these ships to advertise its products. By the late 1920s and the early 1930s, among the firm's completed zeppelins were the Pony, Pilgrim, Puritan, Volunteer, Mayflower, Vigilant, Defender, Reliance, Resolute, Enterprise, Ranger, and Columbia. Most of these ships utilized helium to become airborne, while zeppelins originally used heated air or hydrogen. During this period, other companies, especially European ones, were constructing airships to transport passengers, including across the Atlantic Ocean. Goodyear also manufactured two airships, the Akron and the Macon, for the United States military during the early 1930s. During World War II, the company manufactured 104 airships for the military at its Akron facility. Following World War II, the Goodyear Zeppelin Company continued to manufacture airships, but it also expanded into producing other types of aircraft and aircraft parts. The main thrust of the company, however, remained the airships. The company now used the zeppelins almost exclusively for advertising purposes. In 1966, the firm created the "Skytacular," a four-color sign that could be flown from blimps and read especially at night by people on the ground. Beginning in the 1950s, the Goodyear airships commonly appeared at major sporting events. The firm manufactured over three hundred zeppelins between 1917 and 1995, but it currently only operates four airships in the United States.